This idyllic property has stunning waterfront views from every bedroom. A perfect place for a romantic weekend or honeymoon, but large enough to accommodate a group. 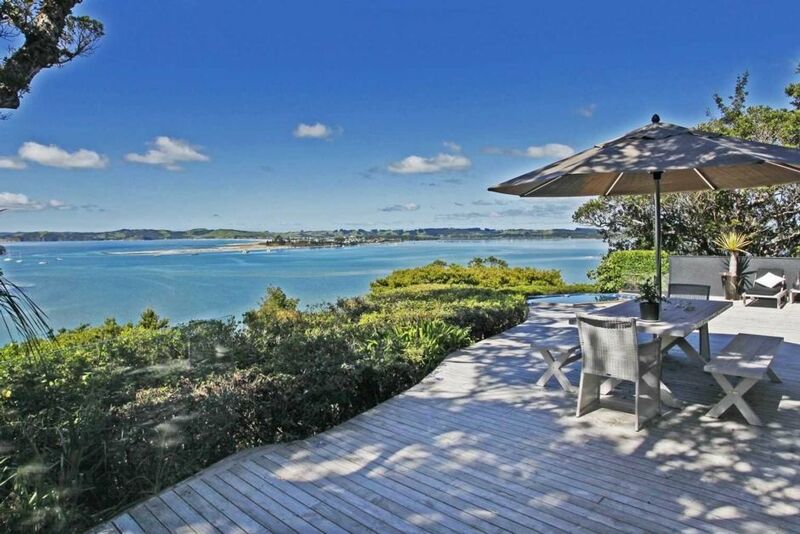 The property is completely private, being nestled among mature pohutukawa trees. Built to maximise indoor-outdoor living it has an expansive deck with a built in spa, an outdoor shower, BBQ, and private access to a sheltered beach. An outdoor table and loungers are all you need to while away the day. The property is situated in Whangateau, which is 8 mins drive from Matakana, 5 mins drive from Leigh, and 15 mins drive from Warkworth. There is plenty to do in the region including visiting Goat Island Marine Reserve, nearby surf beaches (Omaha, Tawharanui, and Pakiri), vineyards, the Makatana farmers market, and boutique and vintage shopping. The property is luxuriously furnished and comes with lots of mod-cons (e.g., espresso machine, BBQ, fans, hairdryer, iron). The three bedrooms each have their own ensuite (one ensuite doubles as the main bathroom), and the kitchen is fully equipped. A gas fire will keep you cosy on cold winter's days or take a wonderfully hot spa while enjoying the view. Our spa is kept nice and hot all year round. The house is two stories and can sleep 8. All the living area and one bedroom are on the ground floor and two bedrooms are upstairs. - The driveway is very steep and is unsuitable for towing boats or trailers. - There are two flights of stairs up to the front door of the main house. - This is a relaxed bach surrounded by the natural environment and we try to keep cleaning charges for our guests to a minimum. So please don't expect a hotel. - Late checkouts/early check ins are available by arrangement for an additional cost. - Maximum number of people permitted is 8. No non-staying visitors. - No parties or large gatherings. No loud noises between 10:30 pm and 9 am in respect of our neighbours who live very close by. - Property is not suitable for children under 7 years. - No smoking on the premises. - pay for any damages or losses to the property/ chattels. - leave the premises in a clean and tidy state with all doors and windows locked, heaters, towel rails and lights off, and the alarm on. Additional cleaning charges will apply if the house is left in an unacceptable condition. Bath towels and spa towels provided. Amazing house with even better views! We had the best time here. Extremely well equipped house with plenty of room. Sitting in the spa looking out over the bay in perfect serenity was to absolutely die for! We loved that it wasn’t far from Auckland yet felt we were so far away. If you are looking for a relaxing spot with magical views then this is the place for you! Thank you so much for letting us stay. We will definitely be back! This property was perfect for a ladies escape from life, children and work. The spa was the ultimate icing on the cake. Plus the views from the upstairs bedrooms were breathtaking. The only down side was there was no door on the the master ensuite. Such a beautiful escape and so close to the city! Lovely owners to deal with!!! Will definitely be returning again. Thanks Carrina! The house is slightly elevated (36 steps from the car park to the entrance), secluded with a fantastic view of the bay. The outside jacuzzi is a great place to relax. It is tastefully furnished and provides a complete household. We can recommend this house. Lovely modern home with awesome views that changed all of the time. The house had everything we needed, with plenty of towels, bedding etc. Close to Matakana which was handy due to the restaurants and markets. All in all the house was great, the weather was great and the view was the best.